Stat of the day: Trainer Dale Capuano wins 23 percent of the time when dropping horses in for a claiming tag for the first time, as he is doing with #5 Strive for a Cure in the sixth race. In this starter allowance condition, a pair of runners look to have the jump on their rivals. 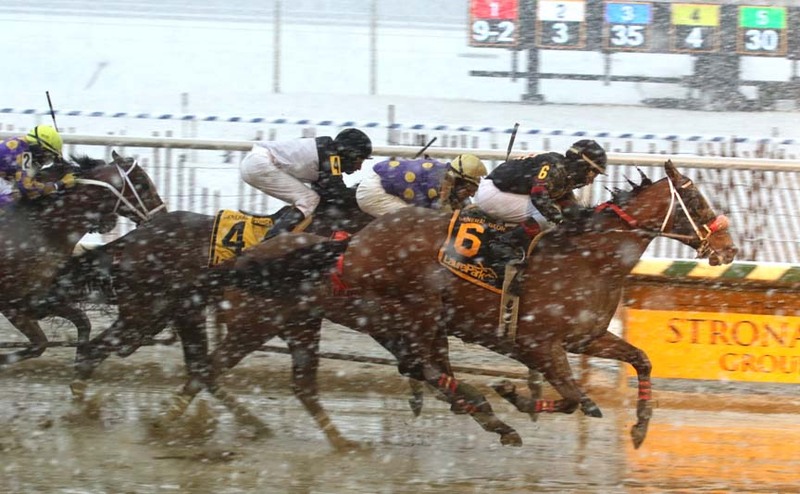 #1 Cherryandthehawk (2-1) and #3 Brushing (9-5) each won a never-two starter last out, with Brushing’s win, on March 10, having come over Cherryandthehawk, who was third that day and then returned to take that condition in a March 30 tilt. They figure to be tough in here, though better odds will likely come from #5 B B’s Busted (8-1). The Parx-based shipper makes her third start off a three-month break, and while here recent form isn’t great, she has competitive efforts to run back to. Speaking of horses with better efforts to run back to, #4 Outvoted (8-1) feels live in this claiming event going two turns. The Juan Vazquez trainee just missed against much better — $25,000 claimers — four back, and in this spot, Vazquez is switching from bug boy Samuel Cardona to his go-to rider, Carol Cedeno. Those aren’t necessarily great credentials, but it’s that kind of group. The favorite, #1 Maynooth (7-5), is a deep closer with only a passing interest in winning races — though note that trainer Cal Lynch puts main rider Trevor McCarthy on today for the first time — and the second choice, #3 Praise the Moon (7-2), is 1-for-40 in his career. Trainer Claudio Gonzalez entered two in this starter event, and with the scratch of #6 Hide the Candy, it looks a lot like that one was entered just to make the race go for his other entrant, #5 Three Phase (7-2). This one makes his first start after being claimed by Gonzalez, Laurel’s leading trainer, and will tackle his elders for the first time. He might sit a good trip in here, as well, with #1 Petion Night (4-1) and #2 Let’s Blaze (6-1) both likely to show speed. Another who might get the right trip is the favorite, #3 Calculated Thinkin (9-5), but it’s hard to get excited about taking short odds on a runner who has lost this race five straight times. There certainly are questions about the favorite in here, #6 Front Line Paige (8-5), but we landed on him anyway. The Neil Morris trainee is set to make his first start since January here after running well against better last out. This race is nicely spotted to have him ready for turf season, which certainly makes you wonder if he’ll be primed in this spot, and he’s showing just a single slow work in the interim. Still, he won’t have to be a killer to beat this modest group. It’s likely that the plan in this maiden event is to send #5 Phil’s Babe (7-2) directly to the lead and see how far she can go. Trainer Cal Lynch adds blinkers for the first time to this miss, whose two prior starts both came at 5 1/2 furlongs. Here – with blinks on and going 1 1/16 miles – she should be able to stroll to the front under Angel Suarez. Lynch is 15-for-67 (22%) adding blinks for the first time. The favorites in here — #1 Hey Mabel (9-5) and #4 Iam a Dancer (7-2) — are hard to endorse on top, as each has at least 19 tries without a win. Our top choice in here, #1 I’mthetapitnow (5-2), has the look of a horse moving in the right direction; his Beyer speed figure has shown noticeable improvement in each of his last three starts, the last two victories, as he’s been moving up the ladder. The Damon Dilodovico trainee won nicely last out for $25,000, and here rises a half-step. The cutback in distance from a mile to 6 1/2 furlongs shouldn’t be much of an issue; he won two back going seven furlongs and drew away smartly that day after stalking the early pace. A longshot worth a look here is #5 Strive for a Cure (12-1). Trainer Dale Capuano drops this one in for a tag for the first time here — a move with which he wins 23 percent of the time — and they’ve handled this one like a horse they like throughout his brief career. There was nothing wrong with the return to action last out by #1 Goodonehoney (7-2). The Great Notion filly — away since a fifth-place finish after a bad trip in last year’s G2 Black-Eyed Susan — found herself in a difficult spot, chasing the speedy, loose-on-the-lead Ms Locust Point, a Grade 2 winner and earner of over a half-million dollars, in an open allowance contest. She finds an easier spot here in this second-level allowance and has a chance to move forward. Jorge Vargas, Jr. will ride for new trainer Michael Moore. Others to consider in here include the veteran #2 Nyx Warrior (4-1), a deep closer who beat similar last out; and #3 Oxhilirating (3-1), a flighty but talented runner who led a long way before settling for third last out and may appreciate the cutback to one turn here. We’re tossing one of the favorites in here — perhaps at our peril. #4 Cool Alley (2-1) earned a gaudy 66 Beyer fig last out while winning by 14 lengths, but that was against bottom-level maidens, and the going should be tougher in here. Instead we’ll go with #6 Freedom Bella (4-1); the Phil Schoenthal trainee dominated $25,000 maidens last out and catches a modest group in this spot. The only runner not rising off a maiden win here is the chalk, #4 Mae Sai Princess (9-5), who has lost this race four straight times, though finishing in the money in the last three of those. A pretty weak group of $16,000 maidens will finish the card, and, I dunno, let’s take a little bit of a swing here with #4 Regal Duet (8-1). This miss, a daughter of Louis Quatorze, makes her debut here for trainer Tim Keefe; she’s out of the Polish Precedent mare Sonata and is a full-sister to half-million dollar earner Regal Solo and a half-sister to two other $100,000 earners. Keefe wins with about five percent of runners debuting in maiden claiming company, and this one’s work tab is modest. But the favorite in here, #1 American Star (5-2), has run nine times with a top Beyer of 35, which means that if Regal Duet can run just a little, she could be in the mix here.